Will Oil Drilling in the Arctic National Wildlife Refuge impact Arctic Ecosystems? In 1980’s, Porcupine Caribou, a herd native to the Arctic National Wildlife Refuge (ANWR), held its status as the 6th largest caribou herd in North America and it was projected to continue its vast growth (Clough, et al., 1987). However, those predictions couldn’t have been more wrong. In 1989, it was estimated that the Porcupine Caribou had a population size of 178,000, but since then they have been on a gradual decline dropping by 3.6% yearly from 1989 and 1998 and and show no indication of stopping. In 2001, it was estimated that there were only 123,000 caribou remaining (Griffith, et al., 2002). These majestic creatures perilously migrate from Canada to a small region of ANWR’s coastal plain, area 1002 (Powell 1991). Area 1002 provides a safe environment for the caribou to calve because the dense vegetation camouflages the caribou, shielding them from potential predators, and the snow present melts early allowing for better calf development and growth (Clough, et al., 1987). 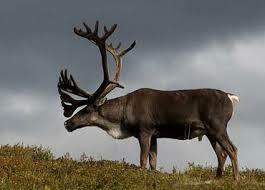 However, the porcupine caribou herd is being threatened by oil drilling in their beloved area 1002. Thus far the coastal plain has been untouched by oil drilling, but it has been predicted that up to 16 billion barrels of oil can be harvested from the coastal plain (USGS, 2016). In 2016 the United States as a whole consumed a total of 7.28 billion barrels of petroleum products (EIA, 2018). The amount oil laying dormant in the coastal plain would be enough to power the entirety of the united states for over 2 years. If oil drilling operations are to commence in area 1002 it would have devastating effects on the porcupine caribou population. The main impact of oil drilling on the caribou is due to the installation of roadways and other structures. In order for workers and deliveries to access each drill site, roads need to be constructed from an existing road to the drill site (Baynard, 2011). Additional infrastructure must also be constructed to hold wastewater, support pipelines, and other processes. The pad and the related infrastructure cover approximately 6 acres total, for each site (Zammerilli, Murray, Davis, & Littlefield, 2014). During migration, the roadways interfere with the caribou’s natural behavior and cause avoidance. It the study, Dyer, S., et al., it was shown that caribou crossed over actual roads six times less frequently than the control roads that were set up for the experiment. These structures act as barriers that limit the caribou’s movement and make them more predictable. This compromises their spacing out strategy and puts the population at and even higher risk for predation (Dyer, S., et al., 2002). This limited behavior goes on to impact the habitats that the porcupine caribou reside in. Roads becoming an obstacle cuts off routes to land that was utilized by caribou causing neglect and overgrowth which decreases the quality of the forage. This is detrimental to caribou because it reduces the area of the breeding grounds and disrupts the beneficial vegetation which is vital for female caribou. On top of this other habitats become subject to overgrazing due to the amount of caribou present exceeding the carrying capacity (Nellemann, C., et al., 2012). Additionally, the increase in human activity that would come alongside oil drilling would cause displacement in the porcupine caribou herd and shift them out of their calving grounds and into other less suitable areas. (Clough, et al., 1987). Multiple studies have been done using the effects of roads on caribou as a focus and they concluded that roads displace caribou. Using relative population densities, it was found that there were virtually no caribou within 5-6 km of active roads and after the 5km mark the caribou density increased dramatically (Dau and Cameron 1992). This displacement would be a huge blow to the already declining porcupine caribou population because it mainly impacts area 1002 which is beneficial for calving and raising young (Powell 1991). The factors such as dense vegetation and low predation would be lost and there would be and increase in the mortality rate of calves. If development were to proceed the caribou would be displaced an average distance of 52 kilometers away from their preferred calving grounds which would increase the calf mortality rate by roughly 8.2%. This indicates that if oil drilling operations were to commence the porcupine caribou would be unable to find an equivalent secondary habitat (Griffith, et al., 2002). The idealistic solution to the problem the porcupine caribou face would be that of a oil drilling band, prohibiting development that otherwise would disturb the caribou on their native calving ground. With legislation in Alaska being passed to enable the drilling of area 1002 it is not set in stone that the area will actually be developed(**npr). As the United States sits currently in the number one position globally for oil production (**eia), and an overwhelming portion of the Alaskan economy based on petroleum energy(***UA) a solution that appease both the want to drill for oil in the area and the need to protect the land for the wildlife that inhabit it should be looked at in hopes of preserving the area. With this in tow we propose the idea of horizontal drilling as a means to obtain the oil in area 1002 that would limit the environmental impact on the porcupine caribou in a way that would still allow them to use the area being drilled without to much disruption. Horizontal, or extended reach drilling is a means of drilling in which a wellbore, or pipe is drilled vertically down to a known depth in which oil and gas deposits are known to sit at which the wellbore enters the “kickoff point” where the wellbore starts to curve until it is horizontal (Doman,2016). The unique way in which the pipe can extend outwards from it initial drilling direction allows for a single oil pad to pull oil from multiple sources(***APPEA**). Due to these difficulties we propose the use of horizontal, extended reach drilling in order to minimize the impact of oil drilling on Area 1002. Horizontal drilling is a method in which a wellbore is drilled vertically to a known depth of oil and gas deposits in which it hits the “kickoff point”, at this point the wellbore starts to curve until horizontal (Doman, 2016). Horizontal drilling allows access to multiple oil wells from a single pad, as the borehole can alter its direction in drilling (Uthe, 1999, Office of Fossil Energy, 1999). In conventional drilling, exploratory and extraction wells can only be dug directly downwards. This means that each individual oil reserve must be accessed by its own well pad, including its own infrastructure, covering approximately 6 acres total (Zammerilli, et al, 2014). According to the Office of Fossil Energy (1999), an estimated 42 conventional drill sites would be required to extract all of the oil resources in Area 1002, compared to only 11 using horizontal drilling technology. Going by these figures, conventional drill sites would cover approximately 252 acres total, not including the roads needed to connect these numerous sites, while horizontal sites would only cover 66 acres, with a very significant reduction in the number of roads needed. The difference between these technologies is a bit like cleaning a pool. You want to remove each patch of dirt or algae from the bottom of the pool, like removing oil from multiple reserves. In conventional drilling, you would have to identify each patch from above, and dive directly downwards to clean it. Before moving to another spot to clean, or moving to reach the rest of a patch, you would need to fully resurface, much like building a new drill site. This would be insanely time consuming, and would cause much more surface disturbance in the pool. Horizontal drilling would be like traveling underwater to fully clean each patch, and to reach new patches. This would allow you to more easily and completely clean each patch, as well as moving easier between patches, increasing your efficiency greatly. Advances in horizontal drilling technology has allowed a greater extended reach, with horizontal access becoming feasible at distances of up to 10 kilometers (Aadnoy, 2017). In a headline about Exxon Mobil by Smith (2011), Exxon Mobil stated that it had drilled the world’s longest extended-reach well, a total length of 40,502 feet, close to 12.4 km. Being able to access reserves from such an extreme distance is valuable in sensitive environments such as Area 1002. Oil reserves located underneath valuable calving grounds used by the Porcupine Caribou could be accessed from a more distant location, without the construction of additional surface structures. This would allow both the oil drilling companies to reach valuable oil reserves, while greatly reducing the displacement effects typically caused by oil drilling. Not only would horizontal, extended reach drilling decrease the amount of drilling sites and infrastructure built in sensitive areas, but it would also be more efficient and effective at extracting resources. Horizontal drilling technology allows a single drill site to access 6 to 8 wells, and can match the production of up to 16 conventional sites (Zammerilli, et al, 2014). Geological barriers underground can cause issues for conventional drilling, but horizontal drilling technology allows for ‘designer wells’, where a borehole can steer around these barriers to access hard to reach reservoirs (Office of Fossil Energy, 1999). Another issue is that reserves are not always oriented in a way that makes downward drilling an effective strategy. Reserves can occur in differing shapes and directions underground, requiring multiple conventional drill sites for a single reservoir. However, horizontal drilling strategies allow a borehole to have a greater contact area with the reservoir, as well as slightly changing directions to follow the reservoir’s remaining resources (Benzagouta & Amro, 2017), further increasing the efficiency and production value of a single site. In the study Benzagouta, et al (2007), they state that extended-reach drilling can improve the well productivity by lowering the pressure drawdown; this minimizes operating costs while increasing production. Overall, since there would be increased oil production, and decreased pad construction with this method, there would be maximum profit being made in the oil field, increasing this method’s attractiveness to oil companies. Gaining oil companies support in using this method is important in passing regulations pertaining to Area 1002, as they hold great lobbying power (Pines, 2014). In order to get oil companies to use horizontal drilling, we propose that a law gets passed in which is stated that any new areas that are opened to oil drilling, such as area 1002, are only able to drill if they do so using the horizontal method. Companies in the oil field industry would be opposed to switching from conventional drilling to horizontal drilling because of the cost. Horizontal drilling would be cost more money for the industries which they would not want to do because they think they will not make as much of a profit. Typically, it costs 1.4 to 3 times more than a vertical well, depending on drilling method and the completion technique employed (Joshi, 1991). However, horizontal drilling is able to extract more oil per well than vertical drilling and would increase profits overall. In a study by William Maloy in 1992, it was shown that an average Giddings field, Austin chalk horizontal well will produce 195,000 BOE or approximately three times the field-wide average cumulative of a vertical well. This shows that horizontal wells will be worth it to pay the extra cost to build and produce them because you will get a greater revenue. Even though this study was done in Austin, you can assume that since the same method of drilling will be done in the Arctic, that similar profits will be made.